Tidal’s hi-res Masters (MQA) tracks surpass one million | What Hi-Fi? 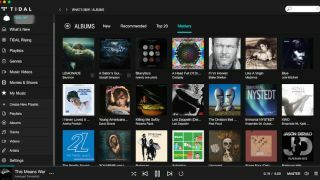 The introduction of Tidal Masters (Tidal's ‘typically' 24-bit/96kHz MQA streams) last January is one of the reasons the music streaming service remains our favourite. In fact, it has just picked up its fourth What Hi-Fi? Award, ahead of the likes of Spotify, which still doesn't have a CD-quality tier, let alone hi-res. At launch, the Masters – available to subscribers of its £20 per month HiFi package using the Tidal desktop app – featured 30,000 tracks, out of Tidal’s 40m catalogue. However, now the number of hi-res tracks has surpassed one million. There are still over 40 times more CD-quality streams than hi-res ones in Tidal’s database, but a growth of almost 3000 per cent in 18 months isn’t bad going. All we need now is for Masters to be accessible on Tidal's smartphone apps and web-based player.